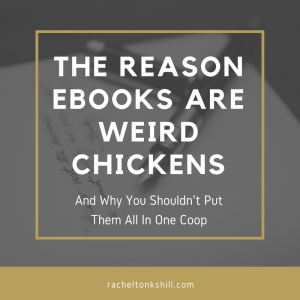 One of the stranger assertions I’ve ever made is that ebooks are weird chickens. That was an attempt on my part to be topical with my marketing. There’s a whole thing going on in the UK with leaving the EU and whether that means we’re going to end up with chlorine washed chicken and anyway that’s besides the point. The reason I jumped to the chlorine washed chicken joke is because I think of ebooks as being chickens. This is largely the fault of my (Hugo Award-winning) friend Susan. During the launch of my first book, she asked if the book was going to be Amazon exclusive, or whether there would be “a free range option” for those who prefer not to buy from Amazon. I thought that was kinda funny and it stuck. So ebooks are weird chickens. Those on Amazon are caged hens, and ebooks from anywhere else are free range. I mean no disrespect to Amazon by this, I just thought it was amusing. And indicative of some of their exclusivity practices when it comes to ebooks, but hey. So, we’ve established that ebooks are weird chickens. Let’s extend a metaphor slightly. There are all sorts of different schemes you can enrol your ebook in when you self-publish through Amazon. Kindle Unlimited and their online lending library etc. All of these schemes promise you more royalties in exchange for a period of exclusivity. Meaning that while it’s enrolled in those schemes, you can’t offer your ebook for sale anywhere else. The promise of extra money might sound good, but it’s not all its cracked up to be. Whatever money you earn from these schemes is entirely at the whim of Amazon. They can change the way your earnings are calculated at their discretion, and indeed they have done in the past. Signing up to these schemes is essentially signing over control of your work to someone else. I believe the extra money earned through these schemes isn’t worth this loss of control. It’s not just the Amazon schemes I’m wary of. Offering your work solely through Amazon puts it at risk in other way. 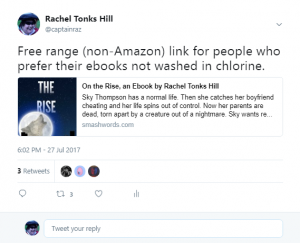 While the chances of Amazon suddenly shutting down is unlikely, there are other ways you could lose your one income stream if you only publish with Amazon. There was that fracas a few years ago in which Amazon unilaterally re-categorized all books, not just ebooks, with LGBT themes as containing adult content. This meant that none of those books showed up in searches. Amazon eventually went back on the decision and recategorized the work, but the damage was done. If the authors of those books only had their work up on Amazon then the company’s unreasonable decision to recategorize their work will have severely impacted their earning potential. That’s why I don’t believe in exclusivity when it comes to your published work. For me the way forward is to ensure it is as easy as possible for your readers to buy your work. That means offering it through as many different stores and in as many different formats as possible. It also allows you the maximum amount of control over your work, short of only selling through your own online store. You’re not relying on a single company for you income and you won’t be in dire straights if one of them makes a unilateral decision. Putting your work solely on Amazon is like putting all your chickens in one coop. It gets cramped and smelly in there and in the long run isn’t very good for the health of your chickens. The solution then is to make sure your ebooks have enough room to grow. Scatter them across a number of different coops. Feed them well, but let them fend for themselves. Don’t leave them to suffocate in a single coop. Let your ebooks be free range. Please, for their own sake.